Rotavirus mechanics can help develop new improved treatments against infection, reports a new study. The findings of the study are published in the journal eLife. A team of researchers has provided new insight on the mechanics of a virus that causes severe diarrhea and sickness in young children. The study, from the Autonomous University of Madrid, Carlos III Health Institute and National Center for Biotechnology, Spain, could open up new avenues for developing effective treatments for rotavirus, which commonly infects children up to five years old. It is the first paper to detail the interplay between the function and mechanical properties of a 'multilayered' virus. Virus particles enclose their genetic material in a protein shell designed to protect, shuttle and release its genome at the host cell. The structure of virus particles, therefore, need to be strong enough to protect the viral genome in environments outside the cell, and to withstand attacks from the host immune system, to ensure successful infection. Many double-stranded RNA viruses, such as rotavirus, isolate their genome within a core shell that incorporates its own molecular machinery to allow the genome to replicate and spread. Some viruses take this a step further and build extra concentric protein layers that function in other ways, such as to help bind and penetrate their target cells. 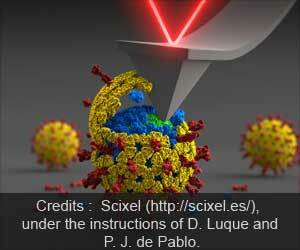 "The complete particle of rotavirus is formed by three independent protein shells. This particle and the subviral particles containing one or two protein layers play distinct roles during infection," explains lead author Manuel Jiménez-Zaragoza, Research Assistant in the Department of Physics of Condensed Matter at the Autonomous University of Madrid. "We wanted to see how the interactions between the layers that define these different particles work together during the virus replication cycle." Although previous studies have revealed how to purify two-layer protein particles, the authors of the current work have developed a novel way to purify single-layer particles, allowing them to be studied individually. After purifying these subviral particles, the team used a scanning probe system called atomic force microscopy, which involves using a small, sharp stylus to deform the virus particles. This allowed them to study the strength and stability of individual triple, double and single-layered particles. They discovered a strong interaction between the external and middle layers, which they say is critical for the protection of the complete virus particle. Meanwhile, the interactions that take place between the middle and inner layers help the virus to replicate its genome among host cells, a process is known as transcription. "Our findings reveal how the biophysical properties of the three protein shells are fine-tuned to enable rotavirus to be carried among host cells," says senior author Pedro de Pablo, Associate Professor at the Autonomous University of Madrid. "We believe this could prove valuable in offering new venues for the development of novel antiviral strategies." New study advocates incorporation of rotavirus vaccine into the childhood immunisation programmes of countries with high rates of diarrhea deaths, and support continued use in such countries where a vaccine has been introduced. India's first indigenously developed and manufactured rotavirus vaccine 'Rotavac' will be available for sale at the rate of around Rs 60 per dose from next week. Virus such as influenza via specific characteristics of viral ribonucleic acid can be detected by our immunosensory system. The results demonstrated by ROTASIIL® in India appear generally comparable to the performance of RotaTeq® and Rotarix® in Bangladesh and in some African countries.